A young woman known only as Darling (Lauren Ashley Carter) is hired to housesit a large New York home for a rich woman (Sean Young). She is told that the previous caretaker jumped from the balcony, killing herself. After discovering a locked door, which she is told she must never open, Darling slowly goes insane. Like a lot of independent films these days, Darling did pretty well at genre festivals, picking up its share of admirers. Unfortunately its release, especially in the UK, has been low key enough that unless you were specifically checking for it week after week you could miss the fact that it came out at all. Every decade in horror has its scream queen, and every horror fan will argue about who that is for each decade. To my mind Lauren Ashley Carter is the scream queen for the teens. She looks delicate but always portrays strength, she's a talented, expressive, yet subtle actress and she's beautiful but not a Barbie doll. She also seems to truly embrace the horror genre, to enjoy it and make interesting choices within it. This is her best work to date. Though it's just 73 minutes long, Darling moves at a patient pace. The first act reminded me somewhat of Ti West's House of the Devil, as it took its time allowing Carter to simply exist in the space of this large home. What director Mickey Keating does especially well in this early part of the film is give us a sense, even before much has happened, of this house pressing in on Darling. It feels like this should be an open, spacious place and yet it feels small and claustrophobic, especially when Keating shoots the corridor to the locked door. We feel the space itself getting under Darling's skin and into her head. Like almost everything else in the film, this is something we are shown, rather than told. Carter has little dialogue to work with and so it's through her expressions, and through Keating and editor Valerie Krulfeifer's assembly of the images that Darling's descent into madness is communicated to us. Flash frames aren't the most original device by which to give an audience a glimpse into a character's fracturing psyche, but they work here because of the way that Keating deploys them. The flashes seem to become more frequent and invasive as time goes on, building a cumulative picture of Darling's madness. The other thing that makes the device work is Carter's performance, she contorts her face to jarring effect, going gamely over the top. It wouldn't work if we thought these moments were occurring in reality, but it works as something that is in the character's head and threatening to burst out of her. 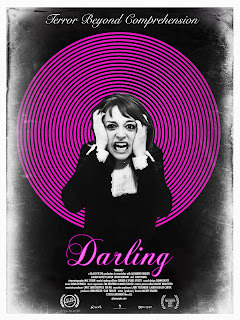 Darling only develops a plot around its midpoint, and then only subtly at first. Darling drops a necklace she found at the house (an inverted cross) and a man on the street (Brian Morvant) returns it to her. It's clear that this man unnerves her, his appearance triggering more frequent flashes and unsettling Darling even more while she's in the house. One evening she gets herself dressed up, goes out, and picks this man up at a bar. When she brings him home it becomes clear that she believes they know each other and that she needs to avenge herself for something he did to her. Up to this point, the film has been unnerving, claustrophobic and sometimes jarring, scaring us in a few different ways. It's at this point that Keating goes for visceral scares, delivering some brutally realised violence that later gives way to creepy surrealism. A late sequence in which the man, a bag still taped over his head, walks into Darling's room is pure Lynchian horror. Keating and cinematographer Mac Fisken deliver all of these flavours of horror in beautifully composed black and white, creating something that feels indebted to a lot of other filmmakers, but specific to them as well. Darling isn't a film for people who want to walk out of a film feeling they have been told everything they need to know. There is an eerie sense of not knowing throughout which is preserved, coming back around as the film ends. This is a great calling card for all concerned, but particularly for Mickey Keating and Lauren Ashley Carter, both of whom are names you should be keeping an eye on. US and UK DVDs are available. HD availability is through US ITunes and NOWTV.